In the summer of 2015, a group of KCC singers from Concert Choir and Cappella toured, participated in workshops, and performed in South Africa. It was a once-in-a-lifetime experience, and impressed the students greatly. 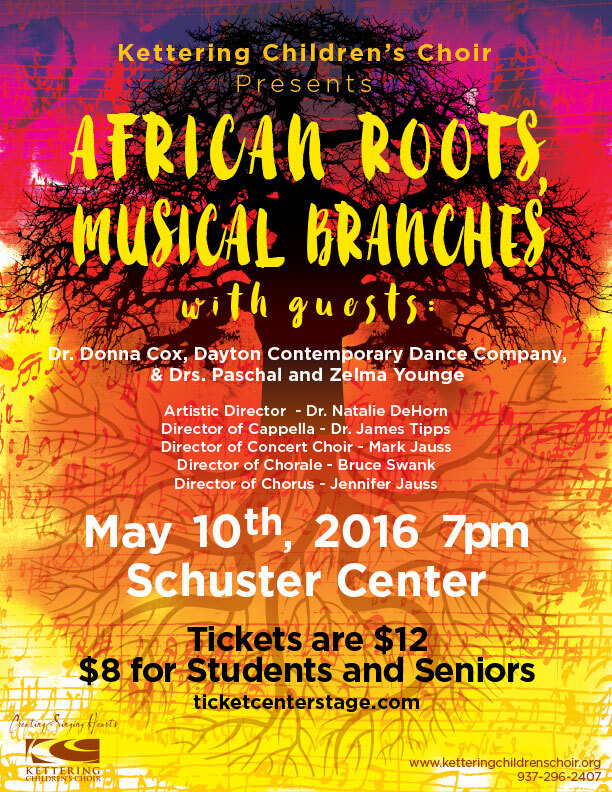 Building on that peak experience, the Kettering Children’s Choir has planned its annual spring concert, African Roots – Musical Branches to be held at the Schuster Center at 7:00 p.m. on Tuesday, May 10. The production involves the total KCC operation – with the Chorus, directed by Jennifer Jauss; Chorale, directed by Bruce Swank; Concert Choir, directed by Mark Jauss, and Cappella, directed by Dr. Jim Tipps. 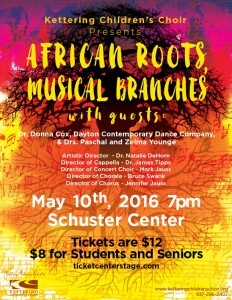 The concert also features exciting collaborations with Dayton Contemporary Dance Company, Drs. Paschal and Zelma Younge from Ohio University, and Dr. Donna Cox from the University of Dayton. Tickets are $12 (Students and Seniors $8) and are available through www.ticketcenterstage.com.